A fantastic day of ziplining, snorkeling, and enjoying a dramatic sunset dinner cruise. Hawaii is known for breathtaking sunsets, vibrant sea life and an active lifestyle. Get a flavor of all of these when you join us for a fantastic day of ziplining, snorkeling, and enjoying a dramatic sunset dinner cruise on the dramatic leeward side of Oahu. This adventure is suitable for families, friends, couples, and anyone who is looking to get a taste of all the best flavors of Oahu. Start out with a rush of adrenaline at Coral Crater Adventure Park. Enjoy a professionally-guided ziplining tour, including three of the best ziplines available at this one-of-a-kind adventure destination. Big and small adventurers alike can find their kind of thrill rushing down the state-of-the-art lines. 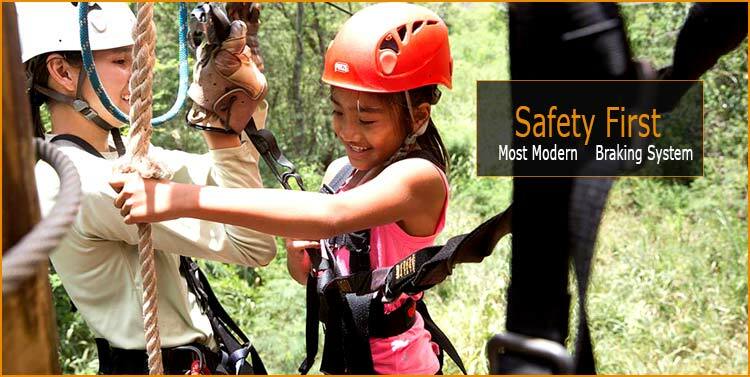 And there’s no need to worry: the Coral Crater ziplines meet all safety regulations, and your experienced guide will make sure you have the correct safety equipment and complete instructions. There truly is no better feeling than soaring over the canopy of tropical treetops like a bird. From the beautiful hillsides of Coral Crater we’ll take you down to the shore to meet your cruise, a comfortable catamaran that takes you out into the sparkling waters of the Pacific Ocean. Right in front of Oahu’s dramatic shoreline you get your chance to come face to face with sea turtles, flying fish, and dolphins. In the winter, you may even see whales! Whenever they spot some interesting sea life, the crew take some time to allow you a closer look, explain all about our marine neighbors, and give you some photo opportunities. Become part of the Hawaiian underwater wonderland during your all-equipment-included snorkel break. After this day of excitement, unwind aboard the Kai ‘Oli’Oli—the name literally means “Ocean Joy”—with a drink and a hot Hawaiian-style buffet while you watch the sunset paint the sky in breathtaking reds and purples. Join us on this worry-free excursion on the wonderful and much less crowded western side of Oahu. Round-trip transportation from Waikiki is included, as well as your snorkeling and ziplining gear, expert guidance, after-swim showers, and narrated tour guidance. The hot buffet includes unlimited non-alcoholic drinks as well as up to four alcoholic drinks per adult. This is sure to be an unforgettable experience for you and your loved ones. Our ziplines feature the most modern braking system which means that zipliners do not need to control their speed or stop themselves, allowing for all ages (within weight restrictions) and abilities to take part in this activity. Our expert guides will be with you throughout the adventure so leave your worries at home and come on out for an experience you’ll never forget!